Did you know that this past Sunday, NASA successfully landed on Mars? The photo above comes to you directly from the surface of Mars just a few days ago. Many of you might remember the Mars Rover missions that were launched in 2004. 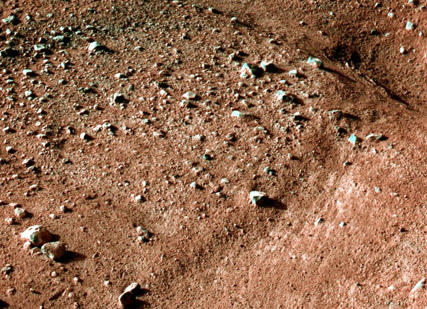 Since then, thousands of photos from the Martian surface have been taken of the areas of Mars where those missions landed. Just this past weekend, NASA made a perfect landing of a new lander onto Mars named Phoenix, this time in a brand new, never explored area of Mars–its Arctic region. I often marvel at how much time the news media spends on celebrity gossip or dissecting some politician’s words ad nauseum, but seems to ignore amazing news like this. Here we are, exploring a new world that has never been seen before, getting crystal clear pictures from the very surface of Mars which has never been seen before. Watching a man walk on Mars may or may not happen in our lifetime, but it almost certainly will happen in your kids’ lifetimes. Get them excited about the new journey with this official Mars Institute patch. The Mars Institute is an independent, non-profit organization dedicated to helping to promote research and exploration of Mars and educational programs. It was founded by some of the top scientists in the world, including top NASA scientists. At a time when Congress looks to cut more and more scientific and research funds, such independent-thinking is truly revolutionary. Already, they are instrumental in doing engineering and planning for future manned Mars missions through such developments as the Humvee Rover. You can help in your own little way by purchasing this patch, proceeds of which will go to the Mars Institute. Of course, the money that goes from here is a pittance, but perhaps the more important investment will be getting your child excited about the journey and the possibilities. And if you’re an educator, what better way to excite your students by giving them an official patch that the top scientists in the world wear?